Dzhokhar Tsarnaev trial: “It was him,” admits his defense attorney. During opening statements, Dzhokhar Tsarnaev’s defense attorney admits his guilt and looks toward sparing his life. A courtroom sketch shows Boston Marathon bombing suspect Dzhokhar Tsarnaev during the jury selection process in his trial at the federal courthouse in Boston, Jan. 15, 2015. At this morning’s opening statements in the trial of Dzhokhar Tsarnaev, the alleged Boston Marathon bomber, two things became clear: 1) The prosecution has amassed mountains of evidence implicating Tsaranev—the heft of it certain to be convincing, the grains of it certain to be horrifying. 2) The defense team doesn’t care. For them, this trial will begin only after Dzhokhar is found guilty. A few minutes before 9 a.m., prosecutor William Weinreb stood alone near the center of the courtroom, staring at the empty jury box. He fiddled with his lectern and microphone. He appeared to be steeling himself to deliver his opening monologue. Soon the jury filed in, the judge offered opening remarks, and then Weinreb began to describe in detail the death, anguish, and destruction wrought by the bombs that exploded near the marathon finish line in April of 2013. He spoke of surveillance tapes that show Dzhokhar at the scene of the crime, lingering just behind a group of children—among them Martin Richard, an 8-year old boy who was ripped apart by the explosion from Tsarnaev’s backpack bomb. Weinreb talked of other footage, as well: video of Dzhokhar, 20 minutes after the bombs went off, calmly shopping at a Whole Foods grocery store, where he purchased a gallon of milk and then switched his mind and exchanged it for a different gallon of milk. Weinreb quoted from Dzhokhar’s Twitter account in the wake of the bombing (“I’m a stress-free kind of guy”), from text messages he sent to a friend (“I saw the news. Better not text me. LOL”), and from the screed Dzhokhar penciled on the hull of the dry-docked boat that he hid in during the police manhunt (“I ask Allah to make me a shahied to allow me to return to him and be among all the righteous people in the highest levels of heaven”). A little less than an hour after Weinreb began, defense attorney Judy Clarke took the lectern for her response. Her manner was more folksy than Weinreb’s. Where the prosecutor had offered rat-a-tat facts, one gruesome reality after another, Clarke slowed down to speak to the jury as though they were having a coffee together. Like they were discussing a mutual friend who’d made a bad life decision. 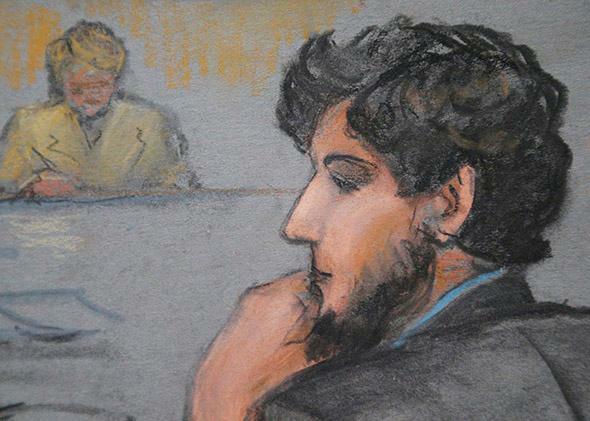 The unspoken answer: Because this jury will decide whether Dzhokhar lives or dies. Much earlier this morning, before the jurors were brought in, Judge George O’Toole had issued a ruling on the prosecution’s motion to exclude “mitigation evidence.” This means evidence that doesn’t speak to whether Dzhokhar committed these crimes, but rather evidence that helps to explain why he might have done it. Namely, that he was influenced and controlled by his radicalized older brother, Tamerlan. When opening statements concluded, the government’s presentation of evidence began. And we saw the shape of this first phase of the trial. In truth, both sides are already fighting over whether Dzhokhar should be killed or spared. The prosecution—while fulfilling its duty to prove Dzhokhar was culpable—will be mostly focused on painting Tsarnaev as a callous, evil monster. The kind of guy who shops for milk after he kills a little kid. Sydney Corcoran, a 19-year-old woman with long, dark hair, recalled waking up on the sidewalk in pain. “I remember a man putting his forehead to mine and telling me I was going to be okay and I just needed to hold on,” she said. “He was telling the people around him that I was going white. And I could feel my body getting tingly, and I was getting cold. And I knew I was dying.” She was brought to an ambulance with minutes to spare before she would have bled out. But she didn’t think her parents, who’d been standing next to her, had made it. “I thought I was an orphan,” she said, through tears. Her mother lost both legs, but both parents survived. But for a man in those circumstances, Dzhokhar looks strangely unperturbed. He has a casual demeanor in the courtroom, wearing his collar open and two buttons undone. He taps his fingers on his attorneys’ binders to play imaginary piano chords. He leans back in his chair, and his feet waggle underneath the table. He smiles a fair amount during interstitial moments. What goes through his mind as he sees this footage, and hears from these people who’ve lost limbs, who’ve lost friends, who feared they would die? Does he simply look at all these white Americans telling their sad tales and equate them to the woes of innocent, civilian Muslim victims of American bullets and bombs? Does he feel twinges of remorse, now that he’s forced to contemplate the residue of his actions in gruesome detail? Or does he spend his time wondering whether this jury will spare his life or put him to death? When the day ended, Judge O’Toole reminded the jury not to discuss, read about, or give any thought to the case until they returned to the courthouse tomorrow morning. “There are plenty of other things to think about in your life,” O’Toole suggested. Sure, I guess. But I find it impossible to believe that any of these jurors can clear their minds of the gory images they saw, or of the testimony they heard. And they haven’t even heard the worst of it yet.